The underlying mechanism of adhesion formation involves injury to the peritoneal epithelium resulting in fibrin matrix deposition to the injured intra-abdominal surfaces. Fibrinolysis by plasmin is typically inadequate in the postoperative period, and the nondegraded deposits lead to adhesion formation. Congenital causes of adhesions (eg, Ladd bands) exist but represent only a small minority of cases. Nonsurgical treatments have been used,  such as anti-inflammatory agents, synthetic inert solid barriers, and fibrinolytic agents. However, none of these treatments has proven uniformly effective under all circumstances. Therefore, surgical adhesiolysis should be performed promptly for patients for whom surgery is clearly indicated but should be reserved for those patients who do not respond satisfactorily to nonsurgical treatment. 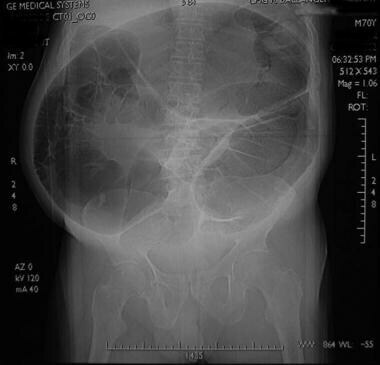 Past surgical dogma dictated that "the sun should never rise or set on a small-bowel obstruction," reflecting the view that surgery is the definitive means of preventing progression to bowel necrosis. This school of thought has given way to a more conservative approach that makes use of nasogastric tube decompression, fluid resuscitation and electrolyte correction, bowel rest, serial abdominal examinations, and radiologic contrast studies. All of these methods have improved over time. Many bowel obstructions can be successfully managed by nonoperative means, but complete or high-grade partial bowel obstructions will require surgical management more often than not. Ultimately, more than half of all patients with small-bowel obstructions who are admitted to the hospital eventually require surgery. 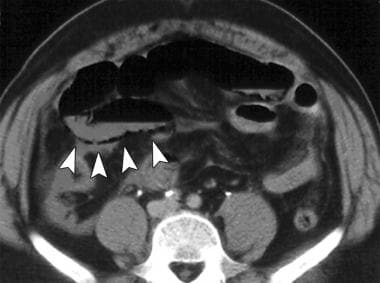 Strangulated or dead bowel, or the fear of such, is an indication for immediate surgical intervention in the context of a small-bowel obstruction. Frank peritoneal signs on abdominal examination findings, demonstrating hemodynamic instability and a lactic acidosis or elevated base deficit, support the clinical diagnosis of strangulated or dead bowel. Bowel ischemia is more difficult to diagnose immediately; however, increasing abdominal pain, a rising white blood cell (WBC) count, and acidosis that worsens despite adequate resuscitative measures are grounds for concern. In this setting, surgical treatment should not be delayed. 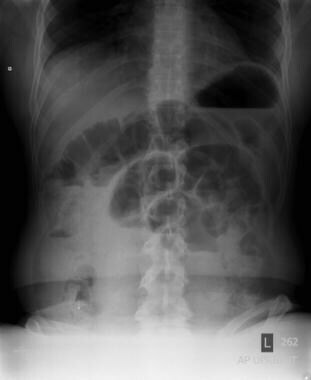 When intestinal ischemia is less likely, the patient may be observed with conservative management. The length of time for which patients can be managed conservatively, if their condition remains stable but does not improve, varies. The period before surgical intervention may be anything from 48 hours to 1 week. However, the decision to operate should be based not on a specific timeframe but on the overall clinical picture and the findings from continuous evaluation. Laparoscopy is commonly used for adhesiolysis because of the elective nature of the procedure and because of the shorter recovery time and lower incidence of pain and infection in comparison with laparotomy. [14, 15, 16, 17, 18] In addition, the incidence of postoperative adhesion formation is expected to be lower after laparoscopy. However, laparoscopic and open adhesiolysis have not yet been compared in long-term randomized trials. The major issue in this approach to treating adhesions is determining which adhesion is the symptomatic one causing pain. The issue of infertility is another indication for surgical treatment (more often via a laparoscopic approach). Adhesions can form that distort the natural tubo-ovarian relationship, precluding normal ovum capture and transport by the fimbriated end of the fallopian tube and leading to fertility issues. The success of the operation depends on the underlying cause of adhesion formation and the severity of the tubal disease. In settings where a surgical approach is considered essential, the viability of the bowel is in question and failure to provide prompt and appropriate treatment can be life-threatening. Given the potentially serious consequences of not performing the necessary operation, only the most significant contraindications (eg, clear advance directives ruling out surgery, a patient who refuses treatment, a futile outcome, or the presence of a known "frozen abdomen") should be allowed to alter the surgical plan. If the situation is not dire, the surgical alternative can always be deferred and a more conservative approach tried first, though this option may not prove advantageous in some situations. Surgical lysis of adhesions may be associated with significant complications; accordingly, care must be taken to minimize postoperative morbidity and mortality. Diamond MP, Freeman ML. Clinical implications of postsurgical adhesions. Hum Reprod Update. 2001 Nov-Dec. 7(6):567-76. [Medline]. Wilson MS, Ellis H, Menzies D, Moran BJ, Parker MC, Thompson JN. A review of the management of small bowel obstruction. Members of the Surgical and Clinical Adhesions Research Study (SCAR). Ann R Coll Surg Engl. 1999 Sep. 81(5):320-8. [Medline]. [Full Text]. Schmidt BJ, Hinder RA. Abdominal adhesions: to lyse or not to lyse?. J Clin Gastroenterol. 2005 Feb. 39(2):87-8. [Medline]. Lalountas MA, Ballas KD, Skouras C, et al. Preventing intraperitoneal adhesions with atorvastatin and sodium hyaluronate/carboxymethylcellulose: a comparative study in rats. Am J Surg. 2010 Jul. 200(1):118-23. [Medline]. Okabayashi K, Ashrafian H, Zacharakis E, Hasegawa H, Kitagawa Y, Athanasiou T, et al. Adhesions after abdominal surgery: a systematic review of the incidence, distribution and severity. Surg Today. 2014 Mar. 44 (3):405-20. [Medline]. Diamond MP. Reduction of postoperative adhesion development. Fertil Steril. 2016 Oct. 106 (5):994-997.e1. [Medline]. Mais V. Peritoneal adhesions after laparoscopic gastrointestinal surgery. World J Gastroenterol. 2014 May 7. 20 (17):4917-25. [Medline]. Gomez-Gil V, Garcia-Honduvilla N, Pascual G, Rodriguez M, Bujan J, Bellon JM. Peritoneal adhesion formation and reformation tracked by sequential laparoscopy: optimizing the time point for adhesiolysis. Surgery. 2010 Mar. 147(3):378-91. [Medline]. Vrijland WW, Jeekel J, van Geldorp HJ, Swank DJ, Bonjer HJ. Abdominal adhesions: intestinal obstruction, pain, and infertility. Surg Endosc. 2003 Jul. 17(7):1017-22. [Medline]. Szomstein S, Lo Menzo E, Simpfendorfer C, Zundel N, Rosenthal RJ. Laparoscopic lysis of adhesions. World J Surg. 2006 Apr. 30(4):535-40. [Medline]. Prushik SG, Stucchi AF, Matteotti R, et al. Open adhesiolysis is more effective in reducing adhesion reformation than laparoscopic adhesiolysis in an experimental model. Br J Surg. 2010 Mar. 97(3):420-7. [Medline]. De Wilde RL, Brolmann H, Koninckx PR, et al. Prevention of adhesions in gynaecological surgery: the 2012 European field guideline. Gynecol Surg. 2012 Nov. 9(4):365-368. [Medline]. [Full Text]. Ghosheh B, Salameh JR. Laparoscopic approach to acute small bowel obstruction: review of 1061 cases. Surg Endosc. 2007 Nov. 21(11):1945-9. [Medline]. Kelly KN, Iannuzzi JC, Rickles AS, Garimella V, Monson JR, Fleming FJ. Laparotomy for small-bowel obstruction: first choice or last resort for adhesiolysis? A laparoscopic approach for small-bowel obstruction reduces 30-day complications. Surg Endosc. 2014 Jan. 28 (1):65-73. [Medline]. Davies SW, Gillen JR, Guidry CA, Newhook TE, Pope NH, Hranjec T, et al. A comparative analysis between laparoscopic and open adhesiolysis at a tertiary care center. Am Surg. 2014 Mar. 80 (3):261-9. [Medline]. Sajid MS, Khawaja AH, Sains P, Singh KK, Baig MK. A systematic review comparing laparoscopic vs open adhesiolysis in patients with adhesional small bowel obstruction. Am J Surg. 2016 Jul. 212 (1):138-50. [Medline]. Lin H, Li J, Xie Z, Zhang W, Lv X. Laparoscopic Versus Open Adhesiolysis for Small Bowel Obstruction: A Single-Center Retrospective Case-Control Study. Surg Laparosc Endosc Percutan Tech. 2016 Jun. 26 (3):244-7. [Medline]. Hackenberg T, Mentula P, Leppäniemi A, Sallinen V. Laparoscopic versus Open Surgery for Acute Adhesive Small-Bowel Obstruction: A Propensity Score-Matched Analysis. Scand J Surg. 2017 Mar. 106 (1):28-33. [Medline]. Ouaissi M, Gaujoux S, Veyrie N, Deneve E, Brigand C, Castel B. Post-operative adhesions after digestive surgery: their incidence and prevention: review of the literature. J Visc Surg. 2012 Apr. 149(2):e104-14. [Medline]. Abbas S, Bissett IP, Parry BR. Oral water soluble contrast for the management of adhesive small bowel obstruction. Cochrane Database Syst Rev. 2007 Jul 18. CD004651. [Medline]. Sallinen V, Wikström H, Victorzon M, Salminen P, Koivukangas V, Haukijärvi E, et al. Laparoscopic versus open adhesiolysis for small bowel obstruction - a multicenter, prospective, randomized, controlled trial. BMC Surg. 2014 Oct 11. 14:77. [Medline]. Yao S, Tanaka E, Matsui Y, Ikeda A, Murakami T, Okumoto T, et al. Does laparoscopic adhesiolysis decrease the risk of recurrent symptoms in small bowel obstruction? A propensity score-matched analysis. Surg Endosc. 2017 Jun 7. [Medline]. 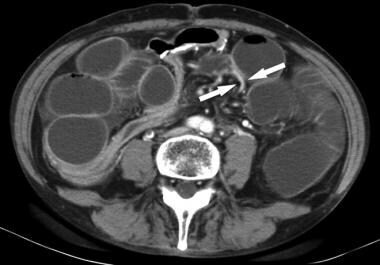 van Goor H. Consequences and complications of peritoneal adhesions. Colorectal Dis. 2007 Oct. 9 Suppl 2:25-34. [Medline]. Roman H, Bourdel N, Canis M, et al. [Adhesions and chronic pelvic pain]. Prog Urol. 2010 Nov. 20(12):1003-9. [Medline]. Sikirica V, Bapat B, Candrilli SD, Davis KL, Wilson M, Johns A. The inpatient burden of abdominal and gynecological adhesiolysis in the US. BMC Surg. 2011 Jun 9. 11:13. [Medline].